Preheat oven to 400 degrees F. Generously grease a regular muffin pan with nonstick cooking spray. With an electric mixer, beat the butter and brown sugar until smooth and creamy, 2-3 minutes. Divide evenly between the 12 muffin cups. Top with pecans. On a lightly floured surface, unfold one thawed pastry sheet. Brush with 1 tablespoon of the melted butter. Sprinkle with 1/3 cup of the brown sugar and 1 1/2 teaspoons of the cinnamon, leaving a 1 inch border around the edges. Gently roll up puff pastry perpendicular to the seams where it was folded. Cut into 6 equal pieces. Place in muffin cups, pressing down gently on the butter mixture and pecans. Place muffin pan on a sheet pan (to catch overflowing caramel, do not skip this step!) and bake until puffed and golden, about 25-30 minutes. Let cool in the pan 5 minutes, then turn out onto a plate. 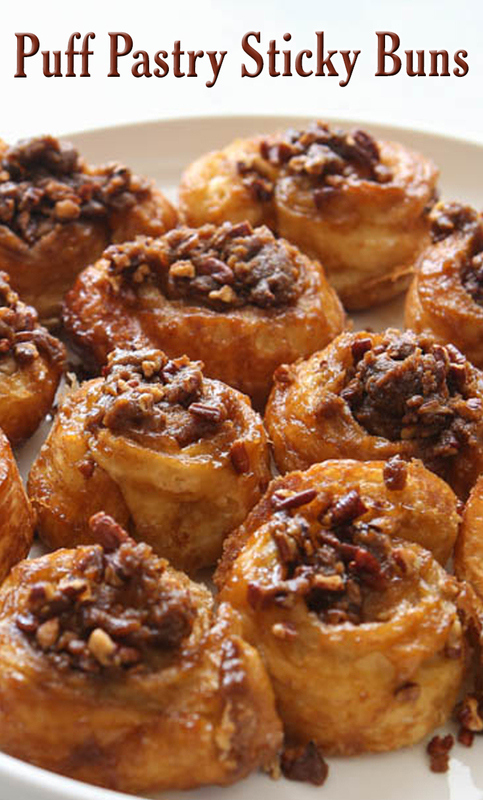 Use a spoon to scoop out any pecans and caramel leftover in the pan and put on top of sticky buns. Sticky buns are best consumed the day they are baked.